Every so often you upgrade your cell phone, your computer, and just about everything else you own but, when was the last time you upgraded your makeup? We asked celebrity makeup artist and lifestyle expert, LeAura Luciano, for some quick and easy pointers so you can avoid the rut, reboot your beauty routine, and reveal a newer, more refreshed version of you! One of the most important aspects of any beauty routine, old or new, is to make sure that you’re using the right products for your complexion. For dull, dry, or aging skin, look for products that are gentle, sulfate-free and non-foaming that also contain hydrating serums. If you have acne prone or oily skin, use oil free cleansers with salicylic and/or glycolic acid to avoid unwanted shine and keep more blemishes from forming underneath the skin’s surface. For skin with rosacea or eczema, gentle products with soothing anti-inflammatory ingredients like aloe vera, chamomile, and green tea, are best. And, for all skin types, it’s important to use a moisturizer that contains sunscreen to avoid damage from the sun’s harmful rays. Makeup brushes and applicators are notorious for harboring bacteria, causing breakouts and even spreading diseases, so start your new regimen with a clean slate by tossing all of your outdated makeup and tools. Don’t know what to keep and what to toss? As a rule of thumb, Luciano recommends replacing mascara after three months — or immediately if you’ve had pink eye or conjunctivitis. Get rid of lipstick, lip glosses, liquid foundation, and concealers after six months, and keep powders and pencils safely for up to a year. As for makeup applicators — clean your makeup brushes every week (especially the ones that are hiding in the bottom of your makeup bag) using a gentle cleanser, and avoid getting water on the handle and the metal part that holds the bristles together (it’s called a “ferrule,” if you really must know). According to Luciano, “Sponges need to be tossed when they start showing wear and tear, and should be cleaned with an anti-bacterial cleanser every 2-3 uses, or at least once a week.” Ideally, sponges also should be kept separate from makeup to minimize exposure to bacteria. The eyebrows frame the face — so naturally, when you change the shape of your brows, you’re also dramatically changing your look. When it comes to shaping your eyebrows, you can skip the professional treatment (and the professional price) by trying one of the various brow shaping kits available. You also could simply use an angled brush and matching powder to fill in your eyebrows and either add a more dramatic arch, or extend them outward, to make your eyes appear elongated. For a more polished look, choose a shadow that highlights your eye color. There are a number of products available that take the fuss out of finding the right eye makeup for your eye color, whether they’re brown, blue, green, or hazel. You also may test different eyeliner formulas, or attempt an updated smoky eye, using shimmery plums, greens, midnight blue, or dark gold for a sultry appearance. Add definition by dusting a light-weight, shimmering powder wherever the light naturally hits your face. Not only do these powders give you a more youthful, radiant, and refreshed appearance, but some even come in skin-soothing formulas that reduce the appearance of fine lines and wrinkles. Bonus! If your favorite hue has been discontinued, chances are it’s time for an upgrade. One of the easiest ways to change your look is to try a new color, either on your eyes, cheeks, lips, or all three (make that “six”). If your go to lip color includes nudes and peaches, try going for something unexpected, like a sophisticated shade of purple to really make your features pop. If you’re known for bold, vibrant colors, tone things down a bit by opting for more subtle, subdued tones. 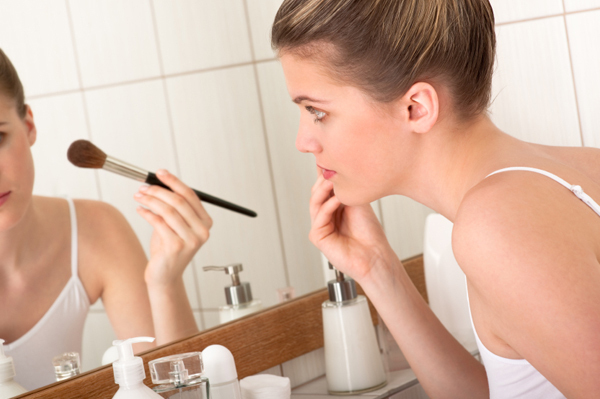 Whatever steps you decide to take when upgrading your beauty routine, be sure to do it often. Just as our technological needs change, so do our skincare needs. Besides, it also gives you a perfectly legitimate excuse to go out and buy yourself some new products — as if you needed another one!